NOME, Alaska – Lightning has ignited two wildfires at Bering Land Bridge National Preserve. The lightning-ignited Tallowpot Fire started on July 19, 2015. The fire was located near the mouth of Placer Creek. The fire had grown to approximately 1 acre and was extinguished naturally (ie. declared out) at the time of discovery. The lightning-ignited Cape Espenberg Fire was discovered on June 23, 2015 on Kikiktagruk Inupiat Corporation tribal lands. 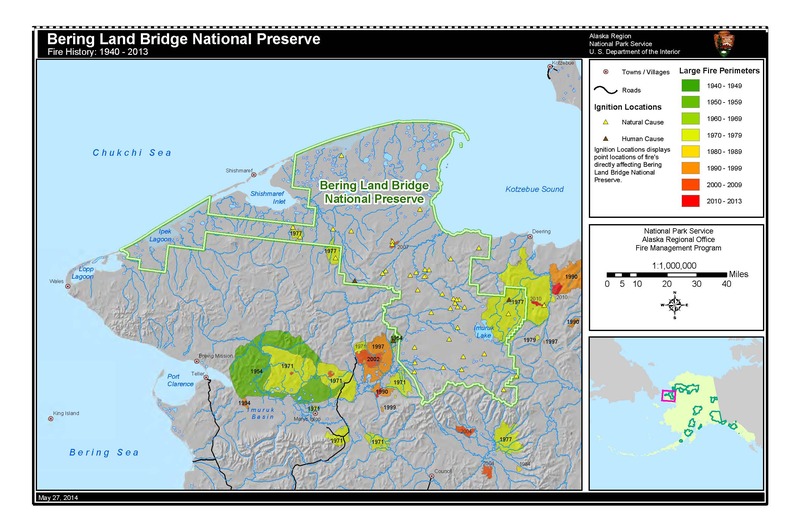 The fire grew to approximately 1,593.6 acres, and burned onto Bering Land Bridge National Preserve administered lands. It was located in a limited management area and placed into monitor status. As of June 2, no smoke was showing. Wildland fire is a natural process in tundra ecosystems. 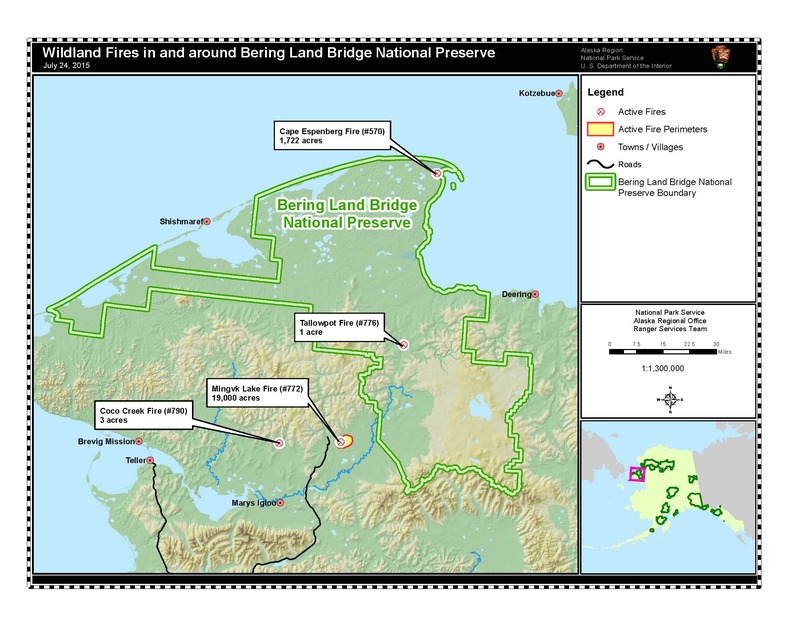 Wildland fires burn on the treeless arctic tundra of Bering Land Bridge National Preserve are infrequent occurrences. The maritime climate near the coast creates cool and mild summers which don’t lend themselves to suitable fire conditions. However, inland from the coast, the rolling landscape of tussock and shrub tundra experiences periodic fires. The immense sweeps of tundra are what firefighters call fuel, vegetation that can and will burn when conditions are right. Tussock tundra has tufted mounds of sedges (grass-like plants) that build up layers of loosely compacted dead leaves and roots under the plants. Tussock tundra is a fine fuel which means it wets and dries out very quickly. During dry periods a lightning strike can ignite this fuel type very easily. In windy conditions it burns quickly and can be remarkably intense. On the flip side, a wetting rain shower can extinguish the flames quickly, sometimes in less than an hour. Generally, after two weeks time vibrant green shoots will likely appear on the blackened tundra. Additional park information is available on the web at http://www.nps.gov/bela. For statewide Alaska National Park Fire News and Information visit http://www.nps.gov/akso/nature/fire/fires.cfm.